Established in 1967, Hyundai is one of the leading — in terms of market share, volume, and performance — car manufacturers in the world. Headquartered in Seoul, South Korea, the company employs over 75,000 people worldwide and its range of vehicles are sold in 193 countries. Hyundai is also a part-owner of Kia Motors, making its reach and portfolio even larger. In the U.S., Hyundai has a manufacturing facility in Montgomery, AL; engineering facilities in Michigan; and design, research, and testing grounds in California, contributing 5,000 jobs to the automotive industry. 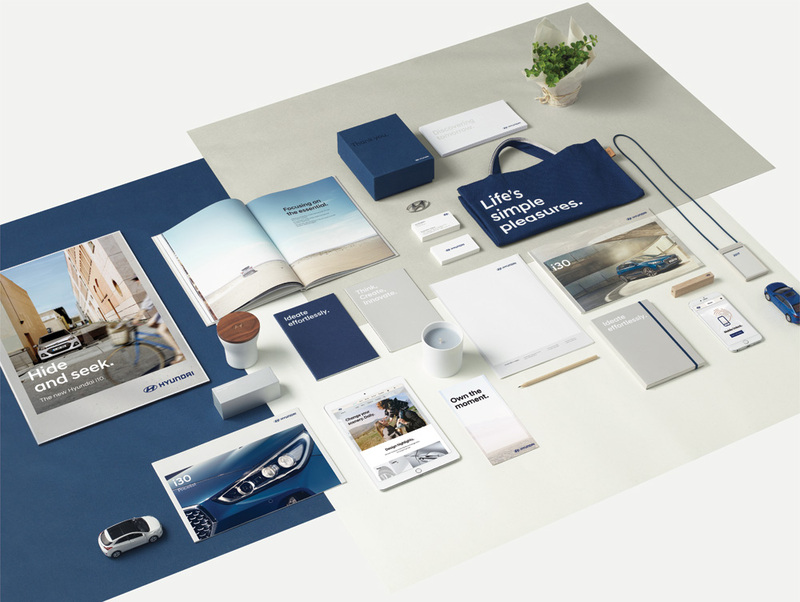 This year, Hyundai introduced a global identity designed by Creative Works, the company’s in-house design group. As one of the world’s largest motor groups, Hyundai Motor Company (Hyundai) sold 4.8 million vehicles in 2016. Rapid, successful growth had led to global brand inconsistencies, as well as lower regional brand rankings in Australia and Europe. Over time, the inconsistent application of individual design frameworks in key markets threatened to harm our brand image. As a result, our vehicle brands were not unique when compared against those of competitors. This prompted us to tightly link our brand to more tangible, “own-able” attributes. There isn’t much to say about the logo as it remains the same minus the tonnage of chrome effects it had previously, which instantly makes it a better logo for print and digital applications, giving it more flexibility and reproducibility. The size relationship between icon and wordmark is also more engaging with the smaller icon, highlighting how underrated the Hyundai wordmark is — because is nice. The shift to a darker blue adds an instant touch of class and makes the brand feel less like an entry-level car and more in line with the Audis of the world. 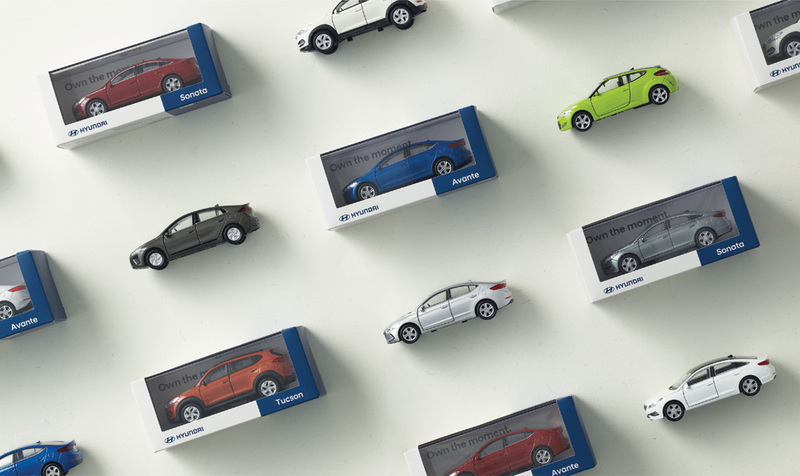 Hyundai commissioned a comprehensive 18-month, global brand re-launch. The brand design concept was applied to every customer-facing marketing touch point: from analogue, digital marketing applications, events and merchandise to sales collateral, sound design, spatial design, sponsoring, and more. The effort’s main objective was to shift the brand’s focus from product to lifestyle in an effort to deliver a consistent, global brand experience to consumers. 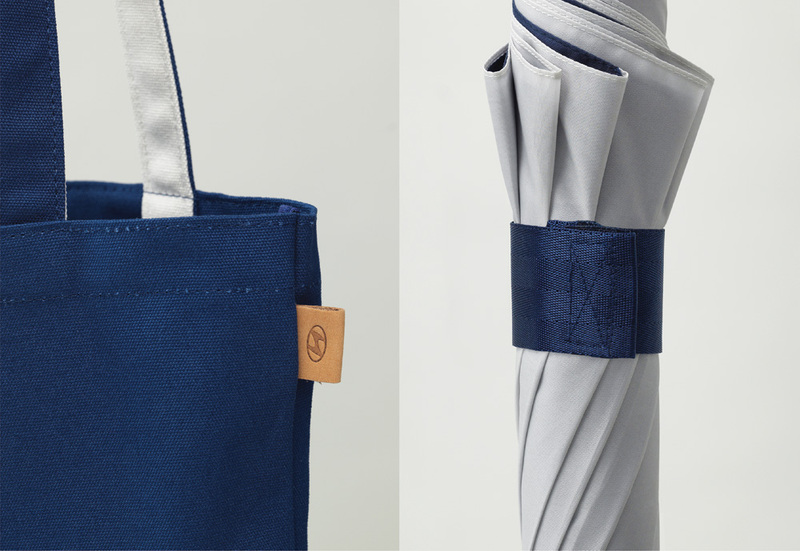 To be distinct in the competitive automotive industry, we drew inspiration from our Korean roots; natural materials such as linen and wood; our culture; our values of balance, harmony and warmth; and the four elements depicted in the Korean flag - water, earth, fire, and wind. They come together harmoniously to form the basis of our redefined brand assets. 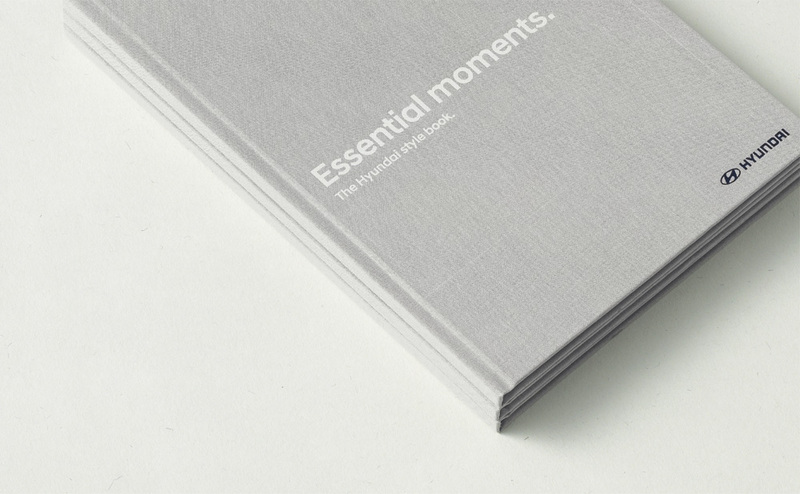 This allows us to focus on the essentials-the special people, moments and experiences that make life truly meaningful. Rich yet simple, these are the things that truly matter: living life with a confident outlook and celebrating the refined details. Richness in Simplicity is the creative, customer-facing expression of our brand essence, Modern Premium. The brand creative direction Richness in Simplicity recognizes that there is beauty in life’s simple pleasures that drives us. This single compelling idea is designed to create strong emotional ties between our customers, products, and services. 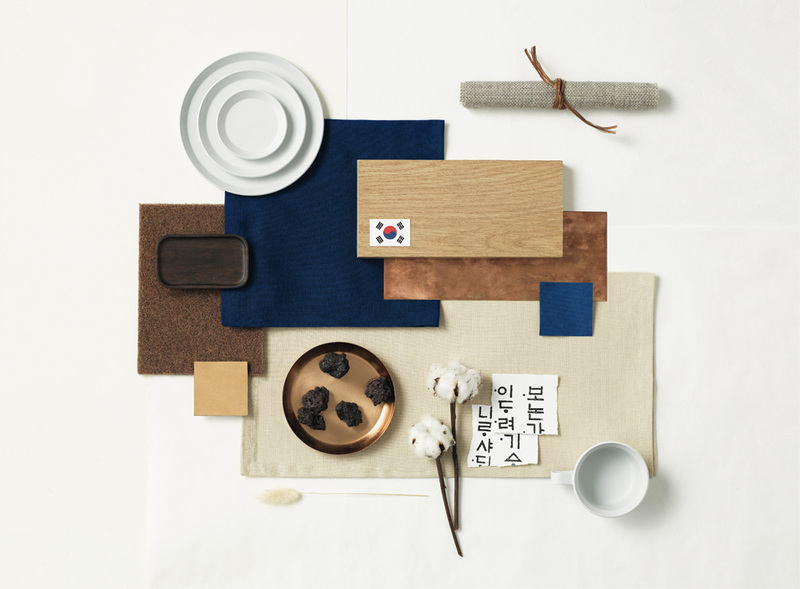 Natural materials from Hyundai’s Korean roots. At first, the idea of a car company referencing nature materials might induce eye-rolling but not only is the image above super extra pretty to look at but it’s amazing how well the application references and feels like many of the objects, textures, and colors pictured above. Consistent, ownable, and expandable, Hyundai is built on five design elements that convey the rich diversity of life’s experiences. 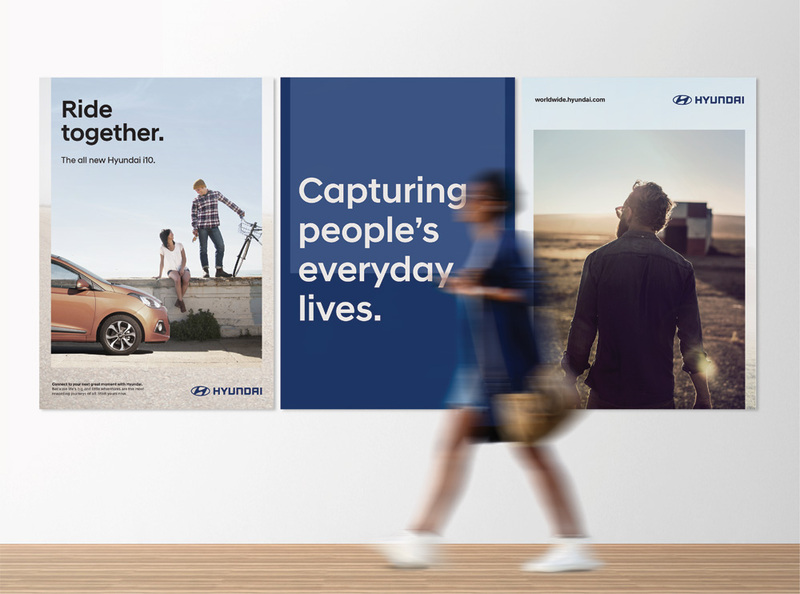 The background layer of our graphic system features ambient surfaces, structures, and natural elements; the story layer in the foreground features imagery of everyday moments, serving as a window into our customers’ lives. Hyundai Sans was crafted for us from scratch to support our communications in 103 languages in 193 countries. 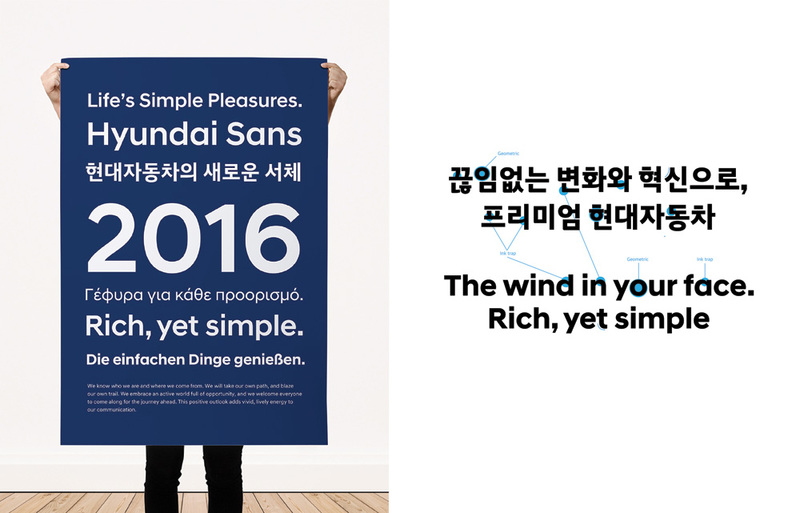 Thanks to its carefully crafted geometric structure drawing inspiration from Korean traditional characters, enhanced legibility, and balanced letter shapes, Hyundai Sans radiates a warm, confident, simple look with a human touch. Our typeface is complemented by a distinctive, harmonious color palette that takes its inspiration from the four elements: earth, wind, fire, and water. Newly redesigned packaging, experiences, mobile apps, and merchandise have also extended the design’s reach. 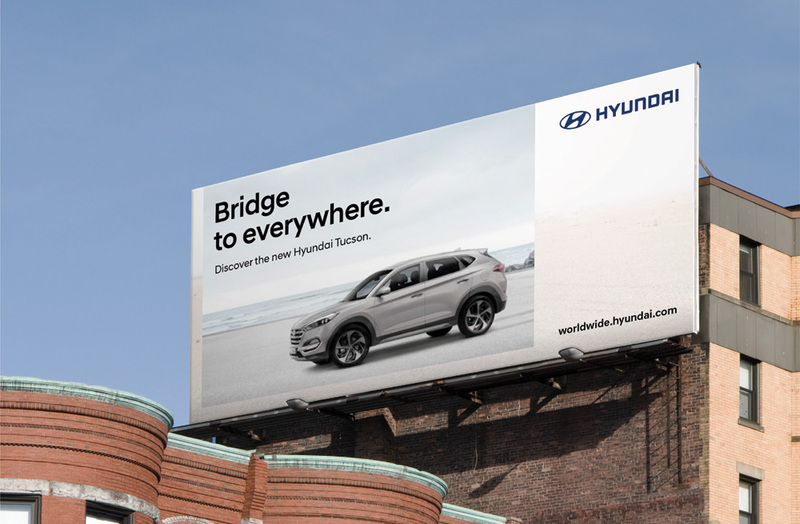 This refreshing improvement in Hyundai’s image has attracted consumer attention and proven the new design system’s scalability across diverse markets and media landscapes. Custom font in multiple languages. Some more about the type family here. How the elements come together. 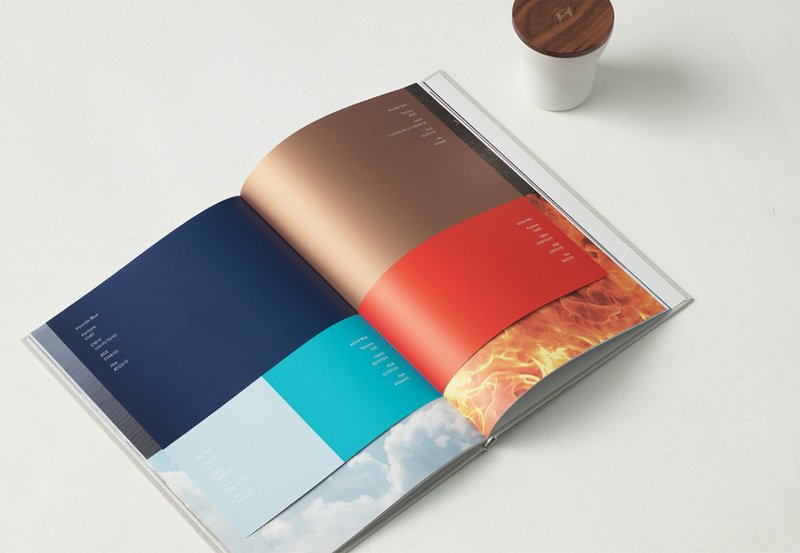 The identity elements are relatively simple: a custom font, soft-and-warm-hued photography, a color palette, and a flush-left typesetting with white margins all around. The custom font is maybe too Lineto-Brown-ish to stand apart as a distinct typographic flavor but as a geometric sans serif aesthetic that expands into different alphabets it makes sense to keep things simple. The photography isn’t earth-shattering but it’s warm and fuzzy vs. the need-for-speed type of images other car companies use. The color palette is beautiful and subdued with the dark blue serving as a strong accent color. Finally, the layouts are as simple as it gets and the “Stage”/”Story” concept is interesting and yields some interesting but subtle combinations. To be perfectly honest, I had never thought twice about the Hyundai brand. I have never driven a Hyundai car and if I have, I don’t remember it, because I have never considered Hyundai to be a covetable car brand. I’m also not a “car guy”, so take anything I say about cars with a grain of salt. 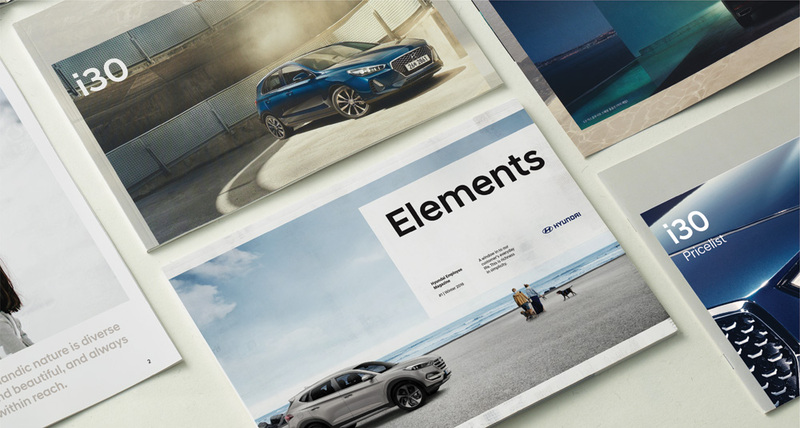 Point being, this redesign gives Hyundai a point of differentiation from Volkswagen, Subaru, Ford, Honda, and others. To me, this new identity says “Drive a well-considered car, one without pretense, and enjoy life”. It’s not a showy brand, it’s not an overly family-friendly brand, it’s not a hip brand. It’s elegant, modest, and solid. I can get behind that… wheel. Established in 1967, Hyundai is one of the leading -- in terms of market share, volume, and performance -- car manufacturers in the world. Headquartered in Seoul, South Korea, the company employs over 75,000 people worldwide and its range of vehicles are sold in 193 countries. Hyundai is also a part-owner of Kia Motors, making its reach and portfolio even larger. In the U.S., Hyundai has a manufacturing facility in Montgomery, AL; engineering facilities in Michigan; and design, research, and testing grounds in California, contributing 5,000 jobs to the automotive industry. 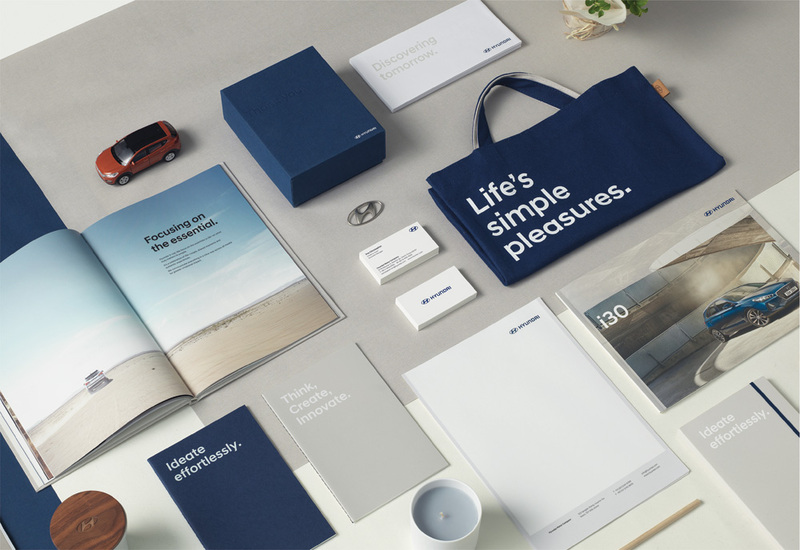 This year, Hyundai introduced a global identity designed by Creative Works, the company's in-house design group.